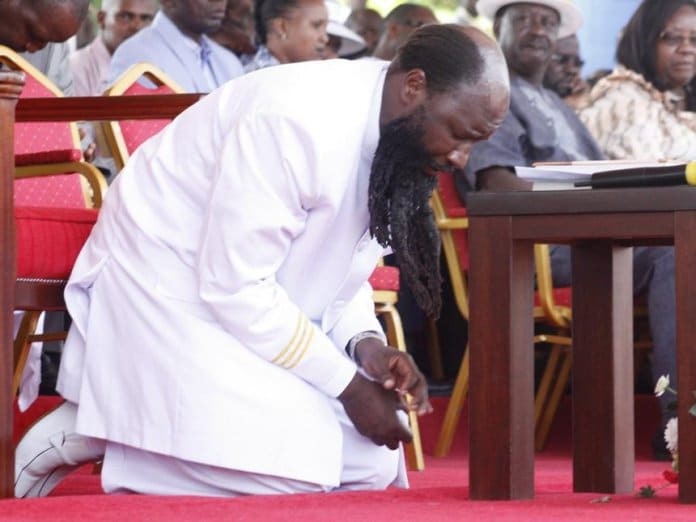 Prophet David Owuor of the Repentance and Holiness Ministries many would say is some sort of a cult leader but what many do not know is that the man of the clothe has been stealing from his relatively poor followers. The publicized three day crusade at the Uhuru Park Grounds saw even men in blue who should be protecting the people, take it upon themselves to let the people know where in deed their help comes from on the streets of Nairobi. Kahawa Tungu only recently came across damning details of how exactly the “man of God” has been taking money from his followers. The budget for the three day crusade was a whooping Sh16, 459, 950 but what caught our attention is the advertising and actual coverage budget. The ministry was initially going to spend Sh5, 200,000 but only ended up spending Sh2, 000,000 over at MediaMax’s K24 TV as is indicated on a receipt dated June 23, 2018. This then begs the question, who pocketed the Sh3,000,000 that was meant for coverage and advertising? Owour is known to enjoy the finest things in life at his followers expense. He has bodyguards that when in public throw a human ring around his motorcade and armed police officers complete with body armor. Many have queried why a man of God who like Jesus Christ should be humble, needs protection from the people he is supposed to serve. It has in the past been said that Owuor’s brainwashed followers submit all their earnings to the church with many giving 100% of their salaries to the church.